The sleepy seaside town of Sligo, based on Ireland's Atlantic coast, seems an unlikely location to base a deep house label. More remarkably, this debut 12" from Sligo-based Splendor & Squalor comes from two residents of the town: longtime DJ buddies and hip-hop/deep house fusionists Brame and Hamo. It's a strong first outing, with each of the three original cuts coming doused in smooth soul and hip-hop influences. That's means beats that swing, sensual strings, chunky bass and the kind of pads that seem to wrap themselves around your body. 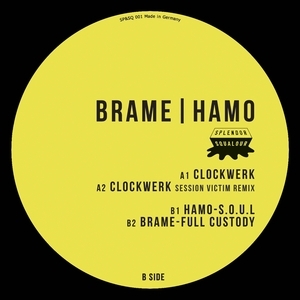 The duo's collaborative "Clockwork" - arguably the pick of the bunch - is also remixed by Session Victim (think ultra-deep goodness), while Hamo's sample-heavy "Soul" offers the perfect balance between smiling deep house and classic hip-house.